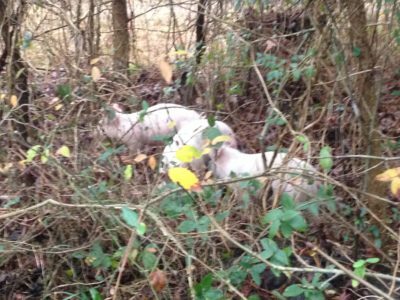 Like most people, we were plenty busy getting ready for the holidays, but that didn’t stop us from getting pigs on the farm just days before Christmas. Jennifer and David were home for the holidays. Why not spice things up with some new animals? On the other hand, what was the rush? I didn’t know it at the time, but our oldest son and his wife and father-in-law were about to surprise us, well me, by coming down for Christmas. It was our oldest who had given me the promise of two piglets for my 50th birthday. Eric had been reminding us about his gift for months, wondering why cows, chickens, rabbits, goats, llama, and donkeys (not to mention orchard, farm signs, storage shed, etc.) had taken priority over the pigs. So, that’s why Robert insisted on making sure that the pigs were on the farm before Christmas. 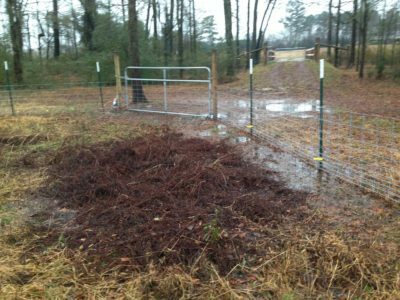 The area we fenced in for the pigs had a nice little wooded area and what we thought was plenty of high ground in case of copious amounts of rain. 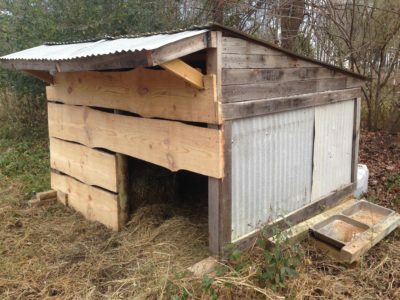 A perfect haven for 3-4 pigs to live in style. And indeed, our first three little piggies happily investigated their surroundings when we first brought them home. Until it rained for five days straight. We awoke Christmas eve morning to a torrential downpour. I knew that didn’t bode well for the Three Little Pigs. I pulled on my tall rubber farm boots and headed out to check on them. Before I even got to the bridge, I could see the water. 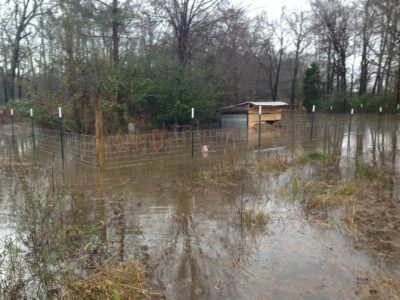 The creek was dangerously high, but even without it spilling over, there was a lot of water all around the pig shelter. I sloshed into the pig yard to take a closer look. Water hadn’t yet entered the shelter. 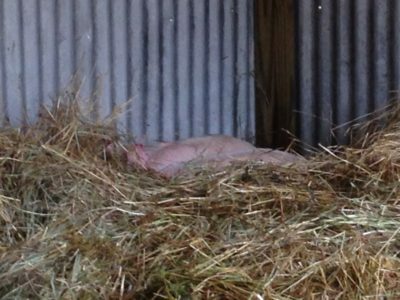 We had placed hay across most of the opening to help the pigs stay warm during the cold winter nights. 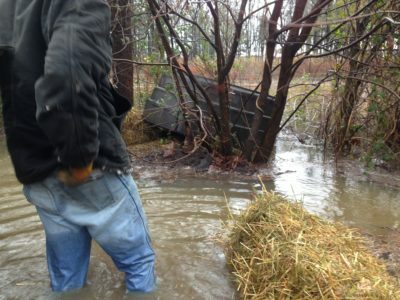 The hay was keeping the pigs dry for the time being. If the rain continued, however, the shelter soon would be under water. Just behind the shelter was some higher ground, a small island of trees. I thought if we could somehow put up a temporary shelter in those trees, the pigs might be able to wait out any real flooding there. Back at the house, I explained to Robert what I had observed. 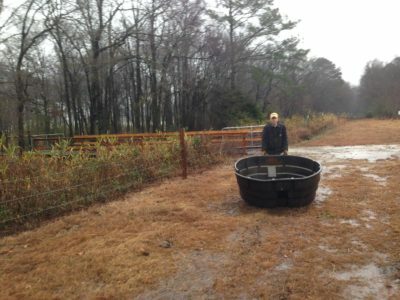 He agreed we should try to create some type of lean-to for the pigs and suggested we retrieve the big water tub we had found on the property to use upside down as a roof. 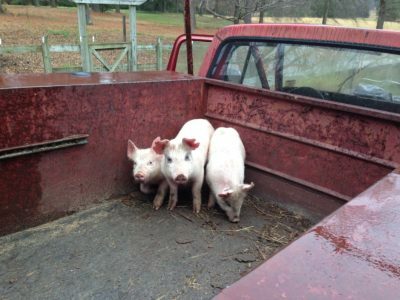 So, we hopped in the old truck, picked up the tub and a couple of bales of hay, and headed back to the pig yard. On the highest ground we could find, we turned the tub over and propped it up on one side with the hay. We tried to “guide” the pigs to the opening, but naturally they just ran away from us. Already, any remaining ground not flooded was getting plenty mushy. We left hoping they would find there way under the shelter before the water got much higher. By late morning, the rain had slowed, and we out shopping for our Christmas eve and Christmas dinners. When we got back a couple of hours later however, the rain picked had up again. Uh-oh, I thought. 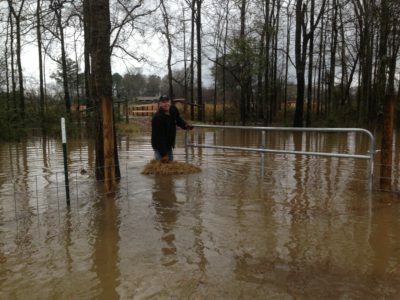 I sure hope the creek hasn’t over-flowed. But, sure enough, it had. 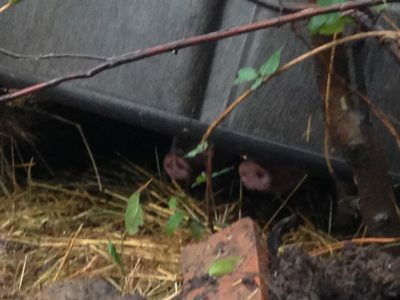 We were wishing we had thought to buy some hip-waders, because that’s what we had to do to see if the pigs were OK. We approached the little tub shelter with trepidation, but were delighted to see two little snouts sticking out. But where was the third little pig? We lifted up the tub and, thankfully, there he was hiding behind the other two. 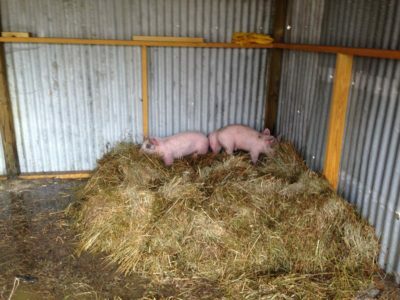 Deciding it was the best course of action, we proceeded to create a new temporary home for the pigs. We somehow managed to drag the extra-heavy, soggy, hexagon-shaped picnic table (with attached bench) the twenty or so feet into the shelter. Then Robert went back to the house for more supplies: field fence to close off the off the front of the shelter, a few boards to tack across the bottom to prevent the pigs from digging out, tools and screws to accomplish this task. 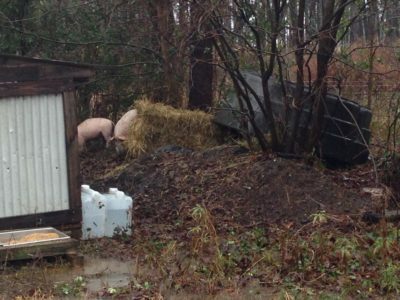 We fixed up the shelter and moved several bales of hay out of the through the flood, out of the pig yard and into the new temporary pig house. But how on earth were we going to move the pigs? We couldn’t very well carry them upside down. We wouldn’t be able to hold them high enough by their hind legs to keep them from drowning. We didn’t yet realize what good swimmers they were, but getting them to swim in the right direction would have been too risky. If they got out of the main perimeter fence, we would never be able to chase them down. Robert suggested using the canoe and I immediately agreed, but we found something better right near the shelter: a large plastic box. We waded back to the pig yard with the plastic box. I waited just outside the fence, and Robert went in to catch the first pig. 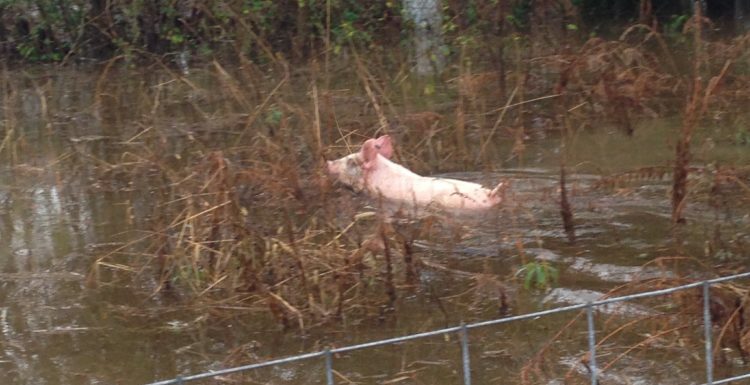 We now saw that the pigs were indeed very good swimmers. Robert reached for the first pig and missed, nearly diving into the water in the process. More determined on the second try, Robert plucked the pig out of the water, carried him over to me, and lowered him into the bucket. I don’t know why I thought this would be the fun part. Little piggie did not understand what was going on and did not want to stay in the box. Fortunately, I was able to sooth him by holding a hand on his back while we partly floated, partly carried the box to the shelter. Robert lifted him out of the box and set him down on top of the picnic table. One down and two to go. We started back toward the pig yard for the next pig. And then the first little piggie started squealing. Like he was going off to slaughter. He jumped down off the picnic table and raced around the shelter. Better hurry and get the other two over here, before he tries to dig or push his way out. We had attached the field fence, but had not yet put the boards in place. The second pig was bigger than the first and all riled up with the squealing of the first pig. We could not keep him in the bucket. We were too tired to lift the bucket out of the water, so the pig was able to jump right out. We remembered that the bucket had a lid, so I went went and got it. 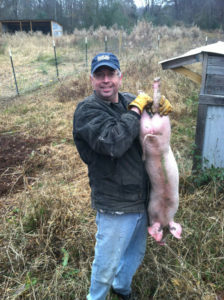 Robert got the second pig back into the bucket, and we quickly slammed the lid on him. We struggled to keep holding the lid on tightly and keep the bucket from over-turning while the pig jumped around inside. When we reached the shelter, Robert managed to get the pig out of the box and safely into the shelter. With his buddy present, the first little pig finally quieted down. Two down and one to go. 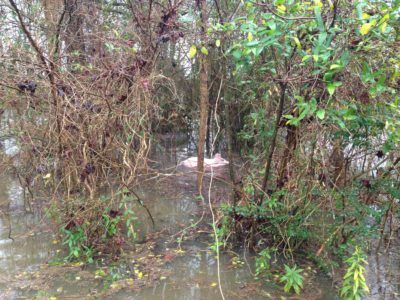 We turned back toward the pig yard, and there was the last little pig, watching us from the fence, paddling around in two feet of water. Would she stay still and wait for us to rescue her? Of course not. While Robert climbed back over the fence, she swam away as fast as she could. Robert waded once more through the water, eventually catching up to her. Into the box she went, and on the lid went. Since there was less water near the shelter, we had to lift the box out of the water for the last 10-15 feet of the trip. Not so easy when the 50 pound occupant is scrambling around inside. Somehow, we made it once more, and the third little pig joined her buddies. 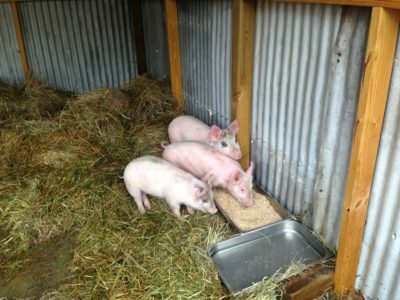 We secured boards across the bottom of the shelter, and the three little pigs burrowed down into the hay pile. Two hours had gone by since we saw those little snouts poking out from under the tub. 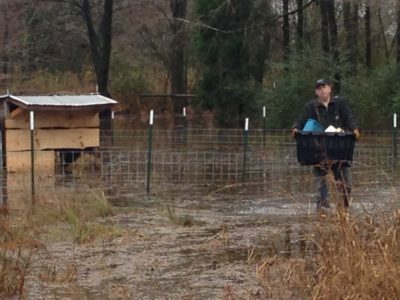 We had dragged a several hundred pound picnic table, and carried three terrified pigs through hip-deep water to safety. 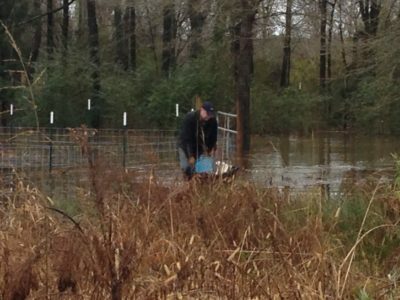 It was exhausting work, but we had succeeded in rescuing the pigs from their flooded yard. 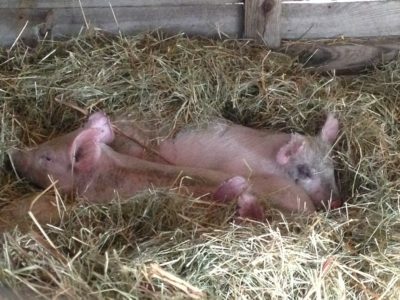 The pigs were safe, and they had a mound of hay which would give them a dry place to sleep. But now what? How long would they be able to stay in the 16 x 20 foot shelter? We would have to move them back to The Chop House eventually. But what would we do the next time it flooded? The pigs would be too big to carry by then, for sure, so how would we even get them back to their yard? We would have to figure that out another day. 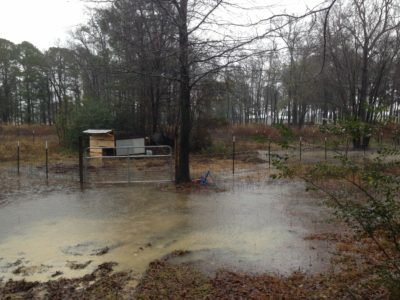 Pig yard is washed out! Where are the piglets? Are they OK? They found their temporary shelter! Well, I sure hope winter is still a far way off here in North Carolina. Seems like it may be a wild ride, though. A couple of weeks ago, we brought home our first two goats – twin Alpine kids, Georgia and Carabel.